We’d love your help. Let us know what’s wrong with this preview of Kissing Persuasive Lips by Dale Wiley. When Mic Mick Lord had the world by the tail until his beautiful wife died. He was young, rich and handsome, a star in Hollywood and in the banking world. But when his wife was killed by a five-time loser driving drunk, everything changed. Mick is trying everything to tempt death, but nothing's working. He's even on an uncanny gambling streak that is just making him richer. To ask other readers questions about Kissing Persuasive Lips, please sign up. Dale Wiley in his new book, “Kissing Persuasive Lips” Book One in the Mick Lord series published by the author introduces us to Mick Lord. From the back cover: Mick Lord had the world by the tail until his beautiful wife died. He was young, rich and handsome, a star in Hollywood and in the banking world. But when his wife was killed by a five-time loser driving drunk, everything changed. Mick is trying everything to tempt death, but nothing’s working. He’s even on an uncanny gambling streak that Dale Wiley in his new book, “Kissing Persuasive Lips” Book One in the Mick Lord series published by the author introduces us to Mick Lord. From the back cover: Mick Lord had the world by the tail until his beautiful wife died. He was young, rich and handsome, a star in Hollywood and in the banking world. But when his wife was killed by a five-time loser driving drunk, everything changed. Mick is trying everything to tempt death, but nothing’s working. He’s even on an uncanny gambling streak that is just making him richer. 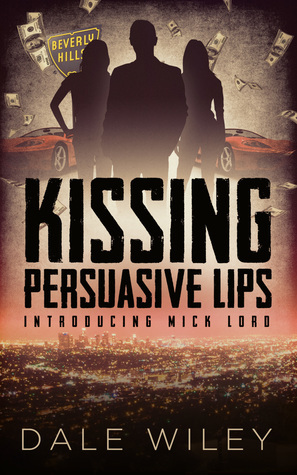 “Kissing Persuasive Lips” is a great introduction to Mick Lord. Mick is one of the most interesting, complex and unique characters that I have read about in quite a while. Bank Fraud, cover-ups and an ingenious frame are part of the recipe for this fast-paced, exciting mystery thriller. “Kissing Persuasive Lips” is very exciting and quite complicated which makes it highly interesting. You never know what is going to happen next. There is a lot going on in this book so once you get started you are not going to want to stop until you finish so I recommend you start early. Wow! Dale Wiley is definitely a new author to watch! I read The Intern and Sabotage before I read this one. I really enjoyed the other two books, but I enjoyed this one more! It is a little different than the other two but that is part of what I enjoy about this author's books. They are all a little different than the one before. In this adventure we meet Mick Lord. I won't give away the plot, it is best enjoyed watching it unfold as the author intended. I will say Mick has suffered, greatly! You Wow! Dale Wiley is definitely a new author to watch! I read The Intern and Sabotage before I read this one. I really enjoyed the other two books, but I enjoyed this one more! It is a little different than the other two but that is part of what I enjoy about this author's books. They are all a little different than the one before. In this adventure we meet Mick Lord. I won't give away the plot, it is best enjoyed watching it unfold as the author intended. I will say Mick has suffered, greatly! You feel for him from the very beginning. He gets involved in a couple of issues and tries his best to solve them. I will say, I loved Mick! He is wealthy, but still a good guy in general! He is not trying to screw anyone or claw his way over anyone. It is nice to see a character like this, a guy we can root for and care about. An ordinary guy in extraordinary circumstances. I was hooked from the first page to the last. This is a must read for me. If you have already read something by this author, this is a nice addition to what you have already read. If you are new to this author, this is a great book to start with. Give it a try, I don't think you'll be disappointed!! I know I can't wait for the next Dale Wiley read in general and the next Mick Lord adventure in particular. I can't wait to see where Mick ends up next!